One bonus is that there are still many recent, big shows which are both shot & broadcast in High-Definition (Happy Valley etc.) yet are maddeningly only released physically on DVD… So there’s a bonus in that you can download an HD version (albeit in 720p) of an HD show which is only available physically on DVD in 576p. Also one other thing they don’t mention is the frame-rate. Given that certain shows would be shot on video at (effectively 50fps – coming from a 25i source), to retain that movement without having to de-interlace would mean you’d have to encode the whole file at 50p (and should the show enclude portions at true 25p – you simply double each progressive frame, so that the file switches between the two seamlessly). This is something that the BBC is doing for their shows on iplayer now (at least the HD ones) – they’re just blanket encoding at 50fps I believe, as even shows that are all 25p have their credits encoded at 50i for transmission. Anyway, it would be interesting to see if the BBC store is doing something similar with their files, especially the older SD material. Definitely needs to be DRM free as that kind of nonsense makes streaming content a real pain much of the time, particularly for those of us on Linux machines, (neither 4OD and Demand 5 work due to the demand that archaic Flash is no longer updated for Linux from version 11 onwards). All the fuss surrounding paranoia about people ‘stealing’ content is just a continuation of the whole palavar started way back in the 70s by the big recording companies over people recording their vinyl to compact cassette. Price is also a huge consideration in that all this stuff has already been paid for. Welcome to Rip-Off Britain! It’s quite interesting to note that in the USA much, if not all material produced with public money is regarded as ‘public domain’ and is as such free to use, and there seems to be no geographic limitation on this. Is not the BBC analogus to being a state body supported by taxation? (I know that in the UK the rules are different and government departments seek to charge us at least twice for things, once through taxation, and then subsequently when we want to access government services – compare the UK’s Ordnance Survey with the US equivalent for downloading GIS data. In the USA it’s free, in the UK it’s second mortgage time!). Seriously, you address the important issues, and it is to be hoped that the BBC will take these ideas on board. The issue of making a reasonable charge for downloads isn’t really an issue with most people, as has been seen with the more sane approach to music downloads, and surely providing the service must cost something, and the idea of investing surpluses made in new programming has to be laudable. Making it globally accessible would also be a great idea, and potentially a big money spinner. Now to persuade the Welsh language broadcaster to make their back catalogue available online, particularly films, as it’s annoying to say the least when I can easily buy Icelandic films on DVD, (at a price!) but finding DVDs of Welsh language films is harder than coming across hens teeth! The biggest problem for me is that I can’t view the content I’ve paid for on my TV. I have a Sony connected with iPlayer, but no TV iPlayer has no log-on capability. 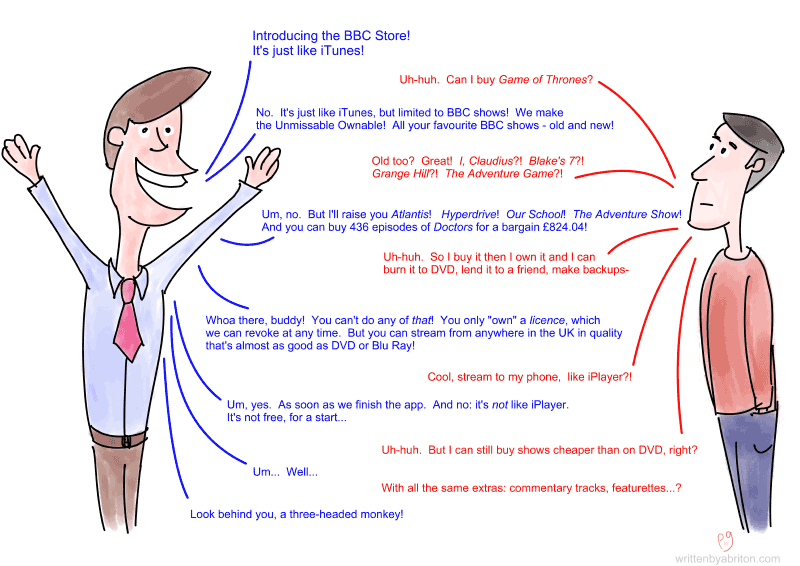 I have a Now TV box with iPlayer – same story. I can stream to my phone, to my tablet, to my PC, but not my TV. But 99% of their archive is not mixed in surround sound! Great article and a total expose of the latest digital rip off. BBC should not be allowed to say you own it because you only own the right to view. Very wrong…what an understatement. All that untapped material in their archives and they try and fleece the public with a this shoddy service. I would expect something more intelligent and classy. PBS has handled the situation of public funded television a whole lot better. BBC by comparison are disgustingly incompetent and greedy. It’s a slap in the face to anybody who ever paid their tv tax. It’s just a bad situation. And somebody needs to fix it. I would agree with the technical issues raised and expect the BBC to improve the service over time, along with the integration into iPlayer. You need to be able to change device easily, particularly where you no longer have access to a device because it has broken etc. iPlayer now requires you to confirm that you have a licence – in future I expect you will need to put in your licence number. I don’t know what proportion of the payment for shows already available on Amazon, iTunes etc gets passed back to the BBC – maybe 70% – but I would expect the BBC to stop pushing their output via such third parties and build the Store into a worldwide system with discount for licence payers, a cumulative maximum annual charge for overseas viewers with a subscription option. There may still be geographic issues of course. The BBC has for many years struggled with funding because of political control over the licence fee which has led to editorial interference. Politicians call the Today programme to complain and demand that the BBC puts all work out to third parties so that it becomes a creative shell. There is good reason to use third party for some production – it spreads the skills into the wider UK creative industry – but not at the expense of retaining inhouse technical and artistic expertise, which can only be done by maintaining training and recruitment and making some programmes in house. Political interference is corrosive to good programmes and good journalism. Therefore the BBC should build the Store into its prime funding source, largely or completely replacing the licence fee. There is enough material available over the years (since film or tape recording at least) for it to become a leading source both for entertainment and historical news information. This is the only way for the BBC to regain independence, deliver what Reith defined all those years ago, stop caving in to government, and to demand that the taxpayer funds things like the monitoring service, licence fees for 75+ and Worldwide broadcasting. The BBC is still a world-class broadcaster and it does promote the UK uniquely. This may require some legislative change that governments usually find unpalatable to put the BBC beyond government (but not parliament) and some way to ensure proper public engagement but it would make for a much healthier and secure Aunty. Great article. I was about to buy some stuff from the BBC store as it has some great Christmas promotions, but seeing the excessive restriction on how and where you can watch it, I’ve decided against it. I’d rather buy and rip the DVD than buy a digital product that is so restricted. I think DRM restrictions apply much the same to Amazon, iTunes and many other digital suppliers, not just the BBC. You are licenced to view/listen etc but strictly don’t own it. It is rather like ‘owning’ your house – you may ‘own’ the bricks and mortar but only have a licence to occupy the land, you don’t own it. Otherwise you could declare independence and pass laws etc. That’s why you hold the property under a Freehold or Leasehold licence, either of which can require paying chief or ground rent respectively. It’s an old business model. It may be that the BBC has had to accept some DRM restrictions as a large institution either because some of their content is already available under DRM and the agreement between the provider (iTunes etc) and the BBC may include terms that the BBC can’t make the content available under less restrictive conditions. You can buy a DVD and copy it, or even record it off air and copy it, but that is strictly illegal I expect if it’s not for your own use. No-one is going to sue an individual for infringement but the Beeb is a much juicier target. Welcome to the murky world of profit at any cost, even if originally paid for by the licence payer. I *want* to give the BBC money for DRM-FREE files of classic TV shows. For the simple reason that, as the shutdown of the BBC store has proved, you cannot rely on outside servers, only computers you control. The BBC has decided for me that in order to watch these shows, I must pirate them illegally. Thanks BBC, for robbing yourselves of money and criminalising me.